This lane was made for you and me. Speedwork is all the rage in the magazines, websites, and books I have been perusing about running and exercise in general. The other day, I finally took a break from words, and headed to the local track at Palmer Square for a “High Intensity Interval Training” session and the hope that the calories would keep burning once I returned to the computer. Miguel follows the trail that lurks below. Palmer Square, spanning seven acres, is one of the smaller gems on Daniel Burnham’s emerald necklace, aka Chicago’s Boulevard System. 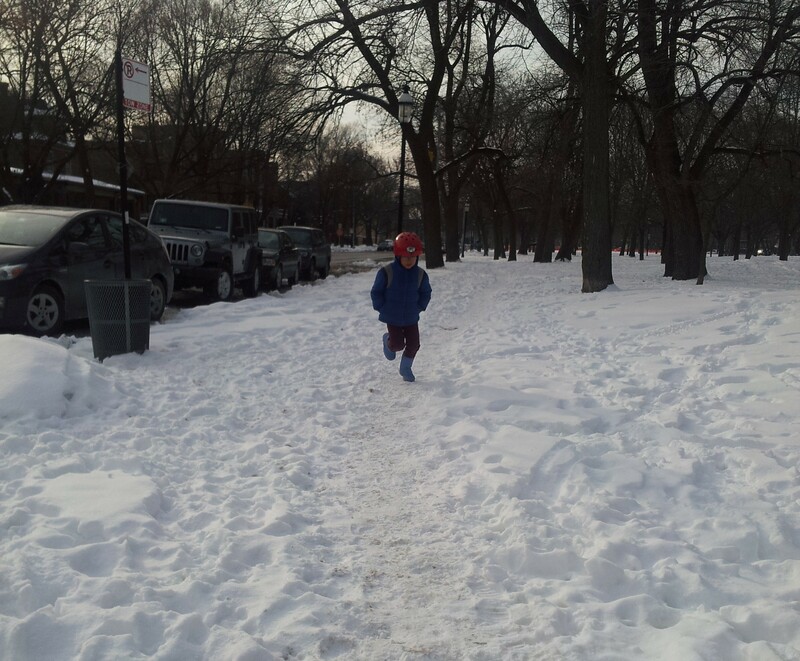 About 6 years ago, in response to Logan Square’s relative lack of park facilities, the Chicago Park District added a .5 mile crushed limestone trail around Palmer’s edge and a subtle playground in the middle. * My running buddies and I often meet there for a few laps before heading south to Humboldt Park, one of the necklace’s grander gems. Because of this winter’s persistent snowpack, we have not seen the track in months. After researching indoor options, which all require fees and travel, I realized we do still have a neighborhood facility: the excessive pavement that surrounds Palmer Square! ** In the past, I have advocated for taking back a lane (or two) of asphalt to enlarge the park. That has not happened (yet), which is a bummer from a green, permeable surface, traffic calming perspective. *** But the good news is that it provides a back up winter running track. For 30 minutes, I circled (or parallelogrammed) the streets around Palmer, speeding up between light poles and street signs and imagining kicking my friends’ butts at our next half marathon. There was plenty of room for the few early morning cars to pass me. The “less time/more work” got me home in time for Miguel’s 2nd wake up call, and my brain buzzed happily all day. The mantra, “streets are for people, not cars” has felt particularly germane to this winter. When the sidewalks are impassible, we walk in the streets. Drivers usually slow down and exchange a friendly wave as I scooch over to let them pass. During heavy snowfalls, Miguel and I carefully nose the tandem along the soft, tan tire tracks left by bigger wheeled vehicles. Rarely do drivers behind us honk. At the next intersection, we stop to let them pass and usually share smiles of “we are all in this together.” Of course, we also get angry (and/or disapproving) looks about the two minute delay we might have caused, but what should I do? Our mobility needs are as important as theirs. Roads evolved to move and connect people and goods. They are public spaces that can and should serve many needs. And when snow and lack of shoveling (grumble, grumble!) erase the sidewalks, you’ll find me in the streets, politely taking my lane. Lots of room for an early morning dash. Talk about excess capacity! *I intended to dive into the back stories of Palmer Square’s renovation, but will save that for another day. In the meantime, here is a big thanks to the folks at the Chicago Park District who patiently and creatively worked with community members to improve recreation opportunities while honoring the historic significance of the area. Below are some related links. **Not that I mind running around the neighborhood. But sometime’s it’s nice to take a break from intersections and stay close to home. ***A buffered bike lane has been added, which helps. And since there is so little traffic, and the stretch is short, the traffic situation already feels pretty calm. Kedzie and Sacramento on the other hand. 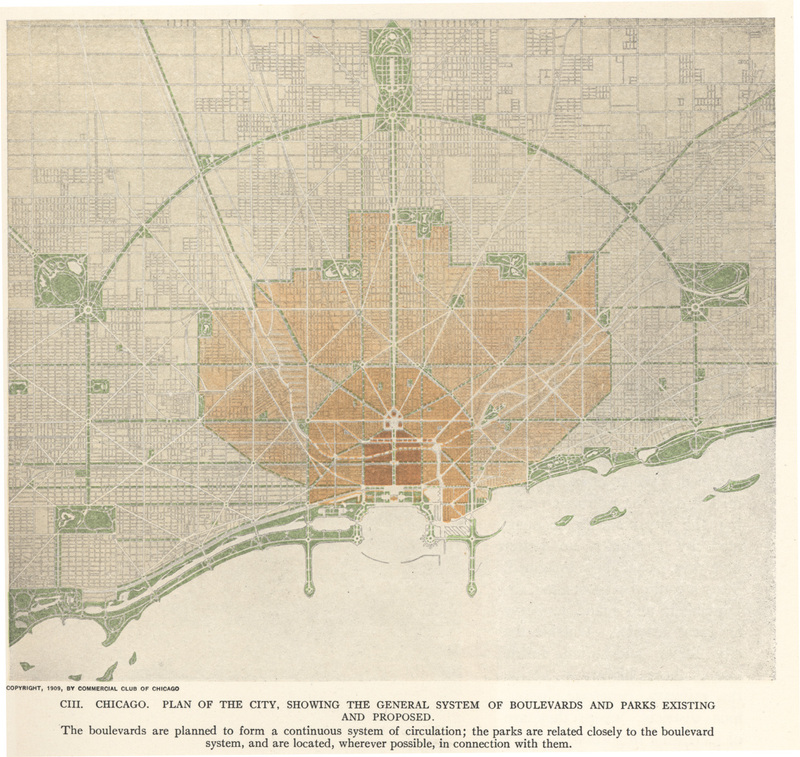 . .
City document about designing the “tot lot” within historical guidelines. Just as a side note, that track was there for a long time before it was improved, but half-hearted attempts to get wood chips to stay in place met with defeat at the hands of Ma Nature. Rain and snow turned wood chips into a muddy mix, then dispersed them entirely into the surrounding grass. I applauded when the current track went in, edged to maintain the shape. It’s a *huge* improvement! Good point. I have been wondering how we can address some of the spots that still have drainage issues that become muddy messes when folks run around them. Maybe spot reinforcement with wood chips? Something to ask CPD, though there are many higher priorities. Yes, and before the wood chips, just a dirt path around the perimeter of the square. As a child growing up on the boulevard in the 1970s, I would imagine the Palmer Square as a horse track. I’m not sure if that is a figment of my imagination, or actual history. But it is so nice to see the square be a center of activity these days. 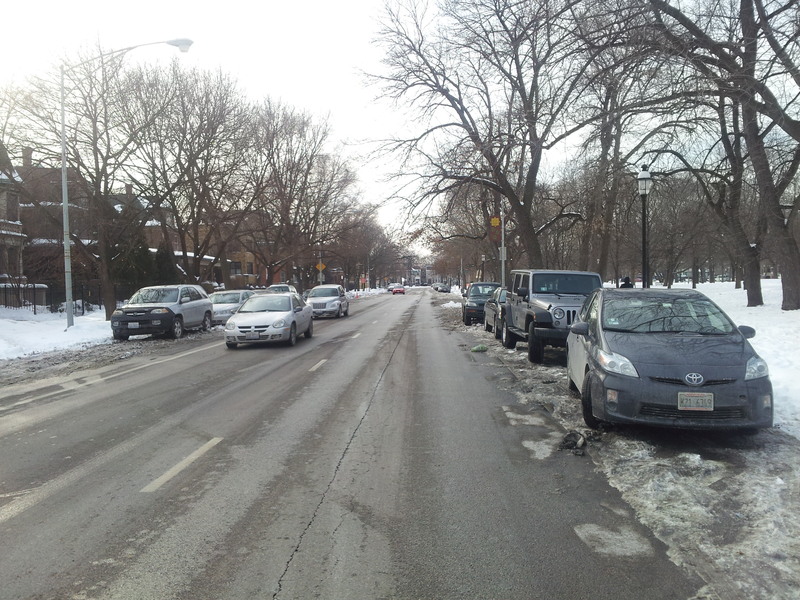 In the winter, the bike lanes do offer great space for runners, though when I encroach, I wonder if the bikers mind. Another option for a track: high school tracks: Clemente, Gordon, Lane? Though they tend not to be cleared of snow unless running clubs are using them. You have pics from those days? Thanks for writing this piece, Gin. I run almost exclusively in Palmer Square in the warmer months, so that I don’t have to worry about the dangers and inconveniences of car traffic. I think of it as my gym. I’ve tried running on the street around Palmer Square, as you’ve mapped above. It feels pretty safe on Saturday mornings, but I feel uncomfortable with the amount of traffic in the late afternoons/early evenings, when I do much of my running. Thanks for stopping by, Joe. I hear ya. This morning I ran with some friends at 8am, and Palmer felt much different than at 6:30. Also, the sidewalks on either side were icy and we did not want to deal with traffic at the east and west ends. We picked our way to Humboldt Park and enjoyed the clear inner road. I feel very grateful for both of these parks. “This lane is your lane, this lane is my lane…”great! How come I never thought of that? And the Burnham connection brings back the old “Burnham impersonation” days. Remember? Anyway, that circular track. Not for bikes? No wonder I’m always running into runners when I take an off-road bike detour from Kedzie to Humboldt! P.S., George Cristiansen is in the Philippines right now checking out Burnham’s stuff over there.